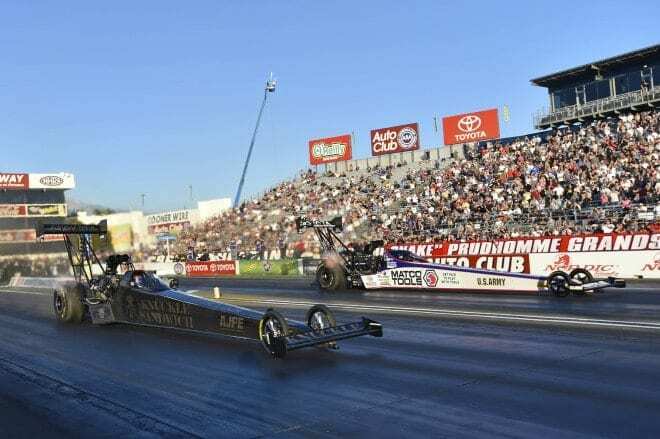 Alan Johnson Racing and driver Shawn Langdon, the sixth seed in Top Fuel in the 2015 NHRA Countdown to the Championship, will not make the trip to Charlotte this week to kick off the playoffs. The team announced it is suspending operations immediately until adequate sponsorship funding can be found. AJR unexpectedly lost its funding one month prior to the start of the season and has been searching for replacement sponsorship ever since. The team started the year on a race by race basis, attempting to put their best foot forward to attract a potential sponsor. Long-time partner Toyota Motor Sales stepped up with additional funding to keep the team going, but the ongoing efforts to secure full sponsorship have so far been unsuccessful. “We are extremely disappointed to make this decision, but at this point, it is our best option,” team owner Alan Johnson said. “The AJR marketing staff has worked diligently throughout the year securing funding to complete the 2015 season; unfortunately we have come up a bit short. The process of securing funding is still ongoing, but our focus has shifted to the 2016 season. Johnson realizes the move will mostly result in the loss of some of the team personnel but says he intends to return to full-time competition in 2016 if support can be found. 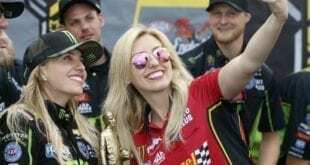 In spite of the lack of full funding, the team put together some impressive runs this season, including recording a 3.662-second elapsed time in Brainerd last month, the quickest in NHRA history. AJR won NHRA Mello Yello Top Fuel World Championships is 2013, 2011, 2010, 2000,1998, and 1997.